We offer gorgeous, spacious, elegant, exclusive halls for your special occasion, business meeting, seminar, reception, wedding, birthday, party etc. 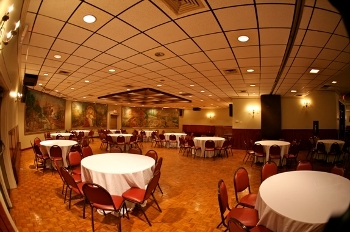 Our facility can be rented for a full or half day, or evening function. Full hall feature high ceiling and amazing chandalier, fine painting, handsome furnishings, parquet floor, antique bathrooms. For your meeting we can also provide stage, audio system and even live music. Large or small, we can accommodate your group. 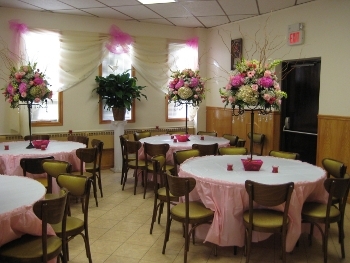 banquet hall capacity - up to 150 persons. 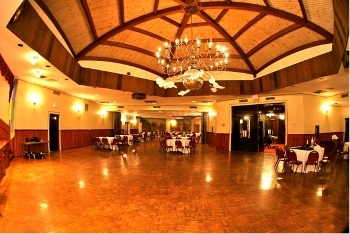 Fantastic place for ballroom and perfect environment for lots of guests as it is for only compact group. We can assist you with hall decorations. Floral Arrangements add a finishing touch to your celebration. Fresh and artificial diverse coloured flower bunches, table, wall, candelabras and podium flowers. We offer decoration with luscious fabrics (silk, organza, tulle) and mood-setting lighting for a romantic glowing effect.